Whether you are graduating or heading home for summer break it is always good to think back on what you have accomplished this past semester. As I look back on a successful semester and year, here are some of the things I reflect on: my academics, work, and extracurriculars. I feel that as a student these are things that have molded me more and more every semester, besides my friends and professional relationships. Academics have always been a way for me to benchmark my performance from semester to semester. As I always remind people, grades should not be the biggest indicator of your success at school because of all of the other things you can do at school. What is nice about grades is that you can for the most part have a steady indicator of your performance from semester to semester. Within these academics I always try to take away one thing that I loved about the class and one thing that I would have liked to be improved. When I say that I make reference to my own performance mainly. I try to take a project and build on it by taking pieces of it towards other classes in the future. When it comes to improvements I usually mean tests…don’t we all? Understanding why you do well and why you underperform are important things to take note of. Work is something that can be on or off campus and that can certainly impact how you perform in the classroom depending on how often you work. For our office, we have more involved work than what other offices may have, so it gives one the opportunity to take on some very hands on projects. These types of opportunities are some of the things that you can build on and take from work to the professional world. On the other hand, working for a fast food restaurant (I worked at Taco Bell for 5 glorious years) can give you many good things to take away as well. Some of those things can be interpersonal communication, training, and leadership skills. These can always help you grow personally and help build your resume! Extracurricular activities can be as big or small as you want. They can be being a part of an intramural team or being the president of an organization on campus. Some things that can be taken away are hands on experience and just some good lasting friendships, which as I graduate here is one of the bigger things I am starting to really appreciate. As always, these experiences are something to put on the resume and take with you to any job you have in the future. Reflecting on your semester is never anything that has to be done, but can certainly be nice to have a close to the year. One more post to go and then you will never have to hear from me again *collective sigh of relief*. Have a great summer everyone! Landed a Job, Now What? As the semester winds down, and for some us our college careers, we are all searching for a great post-graduation job, internship, college to continue our education at, or start our professional career. On the other hand, there are students who are fortunate enough to have found a position that suits their needs following graduation. For this blog post, I will be gearing my thoughts towards the students who know what the next phase of their life holds and what might still be on that to-do list before graduation. A place to live seems like a good starting point when talking about post-graduation plans. Some of us will be living at home (me) for a little while, some of us will be staying where we already are in Duluth, and some will be moving into an apartment or house within a commutable distance to our new job. Of all things, this should probably be priority number one on your list of things to do. In addition, do not just think about a place to live, but think about whom to live with. Make sure whomever you choose to live with is going to be someone you get along with. That sounds simple, but the last thing you want or need is another reason to stress while trying to get acclimated to your new job and surroundings. The living situation brings me to my next point, which could realistically be just as important as this one. Budgeting is a great way to make sure that we have money when we need it (duh, Andrew). In saying that, most of us do not budget and if we do (guilty as charged), we do not follow it. There are many things to think about when it comes to budgeting and it can be as simple as knowing what money you have to work with each week or it can be as complex as having escrow accounts and a categorized area for all of your spending. A budget does not have to be a big production, but it is important to think more forward looking now that we are graduating and may have a car, house, and kids in the next five to ten years. Yeah, I said it, kids. Sorry if that was a bit much for some of you to handle, my apologies. Anyways, a budget is something that is certainly important to be thinking about when you start bringing in a steady income a month or two from now. Putting your best foot forward at you new job could be the biggest favor you do yourself coming out of college. Again, this seems extremely obvious, but it is worth noting because there will be plenty of things on your mind while making the transition from college student to full-time employee, intern, or grad student. The first impressions we make reflect on ourselves, the four years of schooling, and the college we came from (the best one a person can find). This also starts setting the stage for your future promotions, jobs, opportunities, and whatever you can imagine a good impression can do for you. It will be important to always leave behind your personal issues when coming into work and to then focus on the task at hand at work. We will all take our college degrees and do something great. I do not doubt that for a second because we are all Bulldogs; the hardest working students around who know how to find and take on opportunity. I am excited to see what my future holds and what all of my peers’ futures hold. Good luck to everyone graduating and have a good last few weeks of college! Typically, when I write these posts for our blog I feel like I have a firm understanding of what I am talking about. In saying that, this will be a learning process for you and me, but do not worry because I am a trained pre-professional, especially with LinkedIn. I discovered this tool on LinkedIn a month ago and realized it was not brand new, just not very visible or highly used at the time I found it. 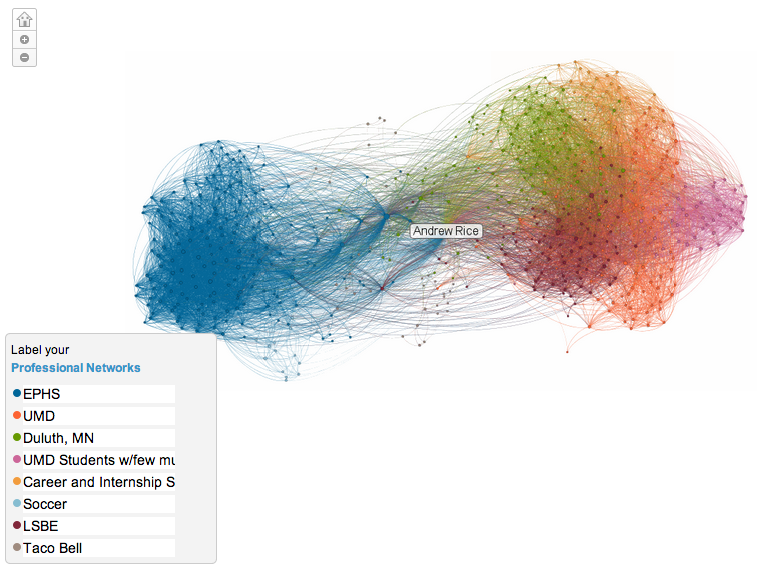 The tool I am referring to is LinkedIn’s In Maps. So, without any further waiting, let’s learn all about In Maps. 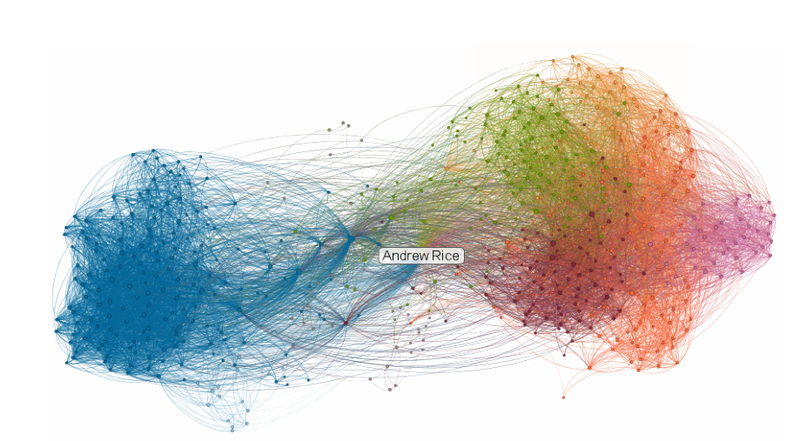 What I have found with In Maps is that it is giving the visual learner the perfect way to understand their network. As you can see, with my In Map the map is color-coded and branched out all over the place. The purpose of the color on the map is to show you that the connections in your network have commonalities. These commonalities can be many different things depending on what the most prominent or relevant items for you and them on LinkedIn are. For me, as you can see in the second image, they are labeled as what you see in the bottom right-hand corner of the image. Those labels were solely based off of what I felt my connection to them was at the time I labeled them. As you can see from my In Map, there is a mess of colors everywhere. So, here is how to clean that up. If you are thinking that you have too “messy” of a network, there is a fairly easy and productive fix. The solution is to hone in on specific people that will help define your network to what you want it to be. For me, I do not mind having a lot of different labels. However if you want to only have a few labels you need to define what you want your future to look like. The In Map does a nice job of forcing you to figure out how you want to build your network and helping you understand where your network could use bolstering. You may be saying to yourself, “this map thing looks absolutely pointless”, and do not worry, because I initially said that too! Need not worry; you did not just waste three minutes of your day, because the feature is quite helpful and easy to access. Just follow this link and you will have your Map in a few minutes. Now, I realize that I have basically left you with a bit of discovering to do, but that is the fun part. It is your network, your LinkedIn account, and your future to build and mold. Give this not so new feature a shot and let me know what you think of it in the comment section below. You have probably seen it before when you have been on your LinkedIn account. 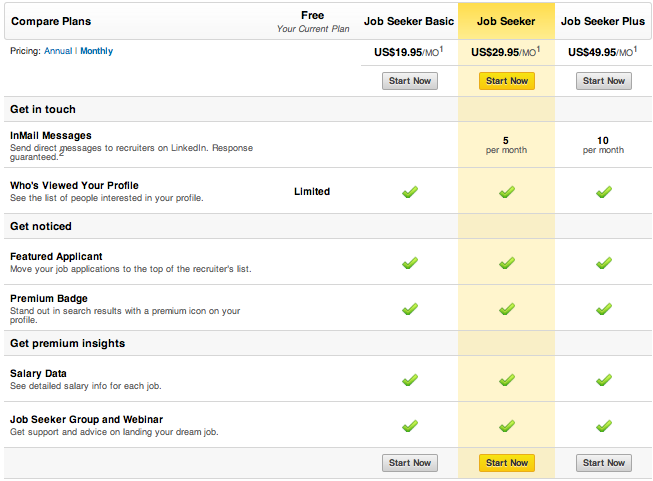 LinkedIn Premium is the step-up from your free and basic LinkedIn account. I currently use the basic LinkedIn account, but have also used the Linked Premium account a couple of times because they offered a free monthly trial. I am not going to say that you should upgrade, but I will let you decide for yourself by the end of this post. If you are familiar with LinkedIn, there is the free and basic account and the Premium account. Chances are you have been invited to upgrade, seen the gold “in” on someone’s profile, or taken advantage of a free upgrade. Of course, we all like free so it may be hard to justify upgrading when you are content with the free account. Allow me to lay out a few reasons why you should upgrade and then you can decide if it is worth it for you! DISCLAIMER: I am not being paid by LinkedIn to promote this feature. Getting in touch with connections and other business professionals is key to finding a great starting point in your career. The Premium feature gives you access to InMail Messages, which allows you to send a message to anyone on LinkedIn. This puts you at an advantage to anyone using the basic account, because you can contact the contacts and recruiters that they cannot. Another great feature of Premium is the “Who’s Viewed Your Profile” feature. With the basic account you can only see the five most recent people that have viewed your profile, but with Premium you can see who has viewed your profile over the past 90 days. This allows you to follow-up with possible connections without having to worry about them moving to far down your list of who viewed your profile. Getting noticed could easily be just as important as getting in touch with someone; the difference is that getting in touch typically relies on you taking initiative. It should be noted that employers like a person with initiative. I personally have not used this feature, but the “Featured Applicant” feature is one that will put you at the top of a list of 10 applicants or 100 applicants. Either way, you are going to get seen before other applicants and you will also get to see what other type of people are applying for the position. The other simple, but effective way of getting noticed is that you will have the gold “in” next to your name on your profile. Everyone will see that and interpret it differently, but to me it would signal that the person is seeking a job or has a high interest in using LinkedIn to its fullest. The cost may sound a bit pricey, but allow me to put it into perspective. If you graduate in 4 years, which not everyone does, college will cost you at least $80,000. Now, if you look at the graphic below, you will see that the highlighted feature is $30. That $30 sounds like a lot, but even if you used that for a full year you would only add $360 to the cost of college, or a .45% increase. Being a college student I know full well that an extra $30 every month is not easy to come by, but I think we can all think of a few things that could be dropped from the budget, or at least reduced. The LinkedIn Premium feature is great and I personally feel that all students could benefit from upgrading to it. It allows you to reach more people, let more people see you, and it puts you at the top of recruiters’ lists when they are hiring. The increased insights and visibility make the upgrade a logical choice for any job seeker, but I will let you be the decider of that. Thanks for reading and best of luck in your job search! There are many ways you could go about navigating LinkedIn to find the perfect connection to a job you are seeking or even directly find your dream job. Instead of overwhelming you with multiple ways of using LinkedIn for job searching I am going to share my favorite feature with you. The feature that I cannot get enough of is the Alumni feature. The screenshots below are how to get to this awesome feature. What I have found over the years as I have used LinkedIn is that you can always find the person you want, but the catch is how do you know who you are looking for? 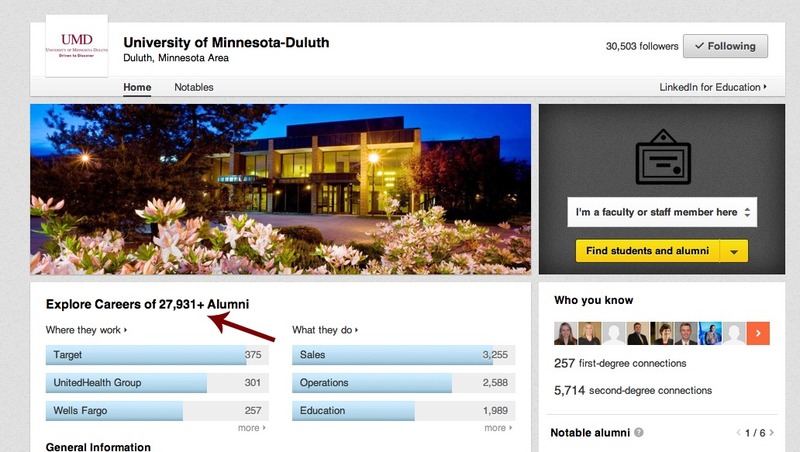 So, let’s take a look at that final screenshot and soak in the number of UMD alumni on LinkedIn, because that is a lot of people. Nearly 28,000 UMD graduates are on LinkedIn, which gives you almost 28,000 people to reach out to. Don’t believe me? Try it for yourself. I am responsible for inviting speakers into the club I am a part of, so where did I go when I needed speakers? If you guessed the alumni feature, you are correct. I messaged 4 people and received 3 responses. The 3 responses…all of them were an excited “Yes”. At this point, I would say ditch reading this and go try for yourself, but if you want a little for context behind this feature stay put! When you get to the feature you will have 6 different things to determine for your search, however you do not have to select responses for all 6 questions. What is nice about this part is that you are quickly able to narrow down 28,000 people to a comfortable 50 or so, depending on how you filter your search. How you work through your search results next is completely up to you. Do you want a recent graduate? Do you want someone established in the field you are looking to dive into? Or maybe you already know someone that is a 1st degree connection, which would be an easy person to talk to since you are already connected. And lastly, maybe you got bored and ditched the search altogether. Hopefully you didn’t. These results quite honestly may not have what you are looking for. If that is the case, don’t worry, because this is how you start learning what companies and organizations you want to work for. Even if you are not finding that perfect connection you can, and should, connect with alumni whom you have shared interests with or possible career goals. As always, send them a personalized note when you connect. Never send them the generic invitation that LinkedIn prompts you to use, unless you know the person well and they know you equally as well. It is not that it is a terrible thing to do, but it immediately shows the person how much interest you have in connecting with them. I have found in my experiences that the personalized message is very well received and also gets a lot of nice responses from the new connection. If you want to learn more about LinkedIn in the Job Search, Ellen (my boss and a Career Counselor in our office) and I will be presenting on Wednesday of this week from 10-11 AM in Ballroom A. Our presentation is called “Social Media in the Job Search” and will cover LinkedIn and Twitter specifically. If you would like to attend our presentation or any others, you should follow this link and register for the Annual Student Leadership Conference in the Ballroom. 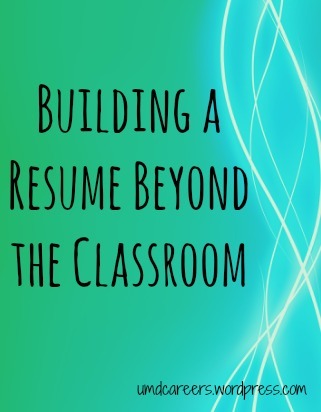 There are many ways to bolster your resume over your college career. You can go strictly the academic route, the more extra-curricular focused route, or go for a nice hybrid of the two. Of course, one would ideally have great extra-curricular activities and have a great set of grades. Although nice, it can be somewhat unattainable if you are also looking to sleep, enjoy a social life to some extent, and stay as healthy as possible. In saying all that, you may be wondering what you can do to stand out to recruiters and possible employers. You may be surprised at how minimal one aspect of your resume can really be to recruiters and employers. Employers want to see you involved with your major outside of the classroom, be involved with student clubs and organizations, intramurals, student government, get a job (on or off campus), be on a committee, really just anything that makes you more than a student that just goes to class! Now, if you just go to class, that is OK! Ideally you are knocking those A’s out of the park in class, but not to worry if not, because to be honest, class gets easier when you have more stuff in your schedule (to an extent). So, if you are not involved beyond the classroom on campus, go get involved! The biggest takeaway from my soon to be four years of school has been that it is to your benefit to be involved beyond the classroom. It makes college more fun because you know more people, have a wider variety of things to do, and employers will notice and appreciate all of the extra time and effort you put into school. If you really take the time to excel outside of the classroom and get at least a 3.0 or better in the classroom, you will be surprised at how many employers will look at your resume in higher regards than someone with a 4.0 and no extra-curricular activities. Now I am not saying that a 4.0 is not impressive, because it is, but do not get hung up in holding that 4.0 when you have the time, resources, and capability to pursue opportunities that may only be available while in college. Although you may not think you have the time to pursue opportunities outside of the classroom you may just be surprised at what you can do. Give it a shot and you may impress yourself and your future employer with all the extra and interesting stuff you can do. With the job and internship search comes many things; looking for your perfect position, an exceptional company, and a great location to work. Though you want to enjoy the company you work for, the city you end up living in sometimes gets overlooked. That’s why I am here! For my position this past summer and upcoming summer I will not be forced to have a drastic relocation, but a lot of my coworkers did, and will. So here are three things to consider about when it comes to relocating if you so choose to. Everyone likes something different, so it is important to think about what is important to you and where you can find that in your new home. Let’s take Minneapolis for an example. Minneapolis is known for its abundance of trails, lakes, and parks; perfect for the athletic person or someone that loves to be outside. In saying that, those three things only do one so much good in Minneapolis due to the weather. So there’s a quick pro and con of the city. It’s worth taking the time to make a pros and cons list of the city you may be moving to. 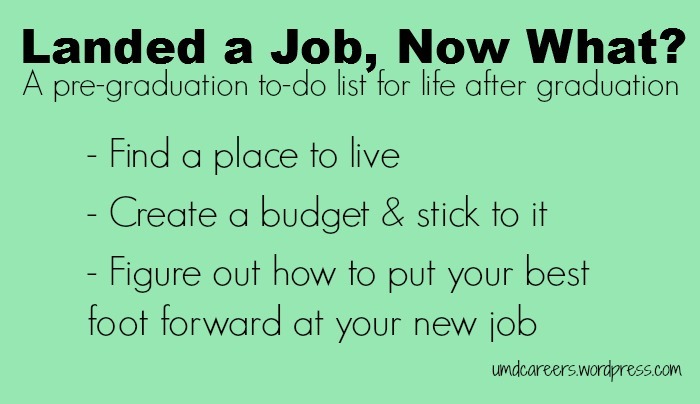 Don’t compare this list to where you already live unless where you live is a viable living option for your future job. Again, knowing what you want to be doing with your free-time is a key to knowing if you have found the right city to be living in. Not all companies offer this, but many do. A relocation package is great at any point in your career, but fresh out of college it can almost be necessary for the financial state some of us are in (myself being one). All relocation packages are different, and they essentially are meant to get you and your belongings from your old home to your new home. I myself do not have one due to how close I already live to where I will be working. On the other hand, my sister moved from Denver to Atlanta and got help from the new hospital she worked for by having them pay for the cost of closing costs on her new home and on the expense of movers and a moving truck. As said before, all relocation packages are different and some people don’t even receive them. Everything depends on the employer and your location. Seems obvious, pick a good company to work for and that’s that. Not so fast on that one. Consider some things when deciding on working for a company. You will always receive an offer sheet with all of the important insurance coverage, benefits, salary, bonuses and so on. One thing you may not know coming in is where there is room for you to personally grow and move in the company. No one wants a dead end job (let me know if I’m wrong on that assumption), so it is good to try and understand where you could be with the company 5, 10, and even 20 years down the road. If you’re not asking that question, don’t worry, but do think about why you may not be interested in growing with the company. Ultimately, most people like the idea of moving up and/or across divisions and departments of a company. It can be a rewarding feeling and reminds you that your work is important and valued by the company. So, make sure you know what you can be doing in your future at your company of choice. Remember, no company is built the same as another, so be aware of the differences between them when it comes to seeing if making a move to a new city and a new job is really what you want to do.